The DRIERITE Laboratory Air and Gas Drying unit is an all-purpose drier. This unit is suitable for most laboratory applications. It will dry air to a dew point of -100° F at atmospheric pressure or pressures up to 90 psig. A simple connection by rubber hose to the bottom inlet of the dryer provides an immediate flow of dry air or gas. This unit is also available with 1 /8 inch SS NPT fittings (Stock No. 26840). Plastic coated mounting clips may be purchased separately. Continuous flows are possible with two units in the line and the necessary valves so that the exhausted column may be refilled while the alternate column remains in use. Note: Do not use this plastic column in the presence of vapors or liquids containing phosphate esters, synthetic lubricants, hydrocarbon solvents, methanol, acetone, lacquer solvents, or other organics. APPLICATIONS: The Laboratory Gas Drying Unit can be used anywhere to provide dry air or gas for applications such as: blanketing, sample preparation, instrument protection, reaction mixtures, purging, vacuum release, venting with dry air. The Indicating DRIERITE gives constant visual assurance of active desiccant. When active, Indicating DRIERITE is a distinct blue color. When exhausted, it turns pink. 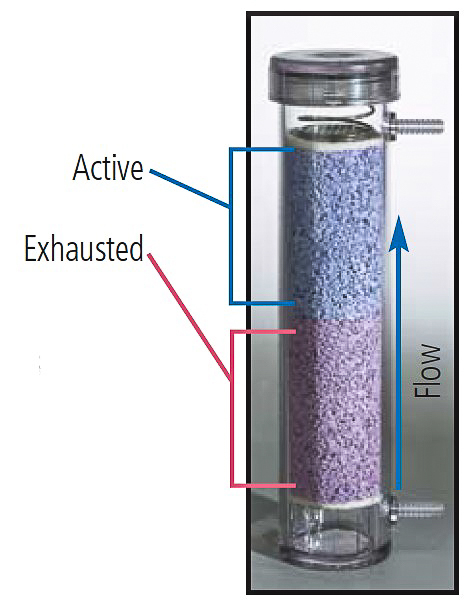 The zone between the two colors in the column may be a purple color and should be a sharp narrow band when the flow rate is at equilibrium. Regeneration will restore the drying capacity. 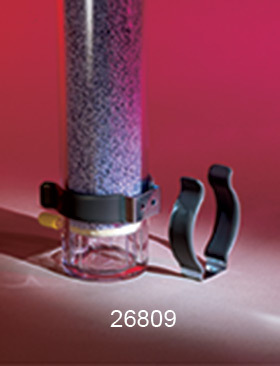 The Laboratory Gas Drying Unit can be refilled with fresh DRIERITE, or the DRIERITE granules can be removed from the column and regenerated. See Regeneration of Drierite Desiccants for details. Construction: Column is molded polycarbonate. Desiccant supports and coil spring are stainless steel. Polycarbonate cap is fitted with o-ring gasket. DRIERITE is held firmly in place between felt filters.